This online-only article is a supplement to the January/February 2016 print edition of Home Energy Magazine. Home performance, long seen as a tool for reducing greenhouse gas emissions, can also help individuals and communities adapt to climate change. To be effective in this role, the home performance industry must itself learn and adapt. When I got started in home performance work in 2001, I did so because I wanted to prevent climate change. Although I believed in, and preached, the mantra of “efficiency, durability, comfort, and health,” what got me up in the morning was reducing emissions of planet-warming CO2. Efficiency, coupled with the replacement of fossil fuels by renewable energy, provided a road map that Rocky Mountain Institute cofounder Amory Lovins dubbed the “soft path” to a carbon-neutral society. Fifteen years later, signs of real progress along the soft path are visible. Renewable energy is booming, and emissions from US power plants are dropping. Although much of the progress on CO2 emissions has been attributed to a shift from high-carbon coal to lower-carbon methane, renewables and efficiency have also played a role. Over that same period, evidence of ongoing climate change has become harder to ignore; we’re bombarded by near-daily news reports of record droughts, floods, and heat waves. I know now what I didn’t want to admit in 2001: It’s too late to prevent climate change. But we can limit it. However, many scientists now believe that our opportunity to limit the global temperature increase to a relatively “safe” level of 2ºC (3.8ºF) is passing rapidly. If we’re to avoid greater warming—and the economic, ecological, and humanitarian disruption that would accompany it—we urgently need to reduce carbon emissions across all sectors of our economy. At the same time, we need to plan and prepare for life in a warmer world. In a 2009 article in Environmental Building News, Alex Wilson and Andrea Ward outline a set of design principles for resilient new construction, many of which also apply to existing houses. Most of the US housing stock of 2050 has already been built; these houses will face different conditions than the ones for which they were originally designed. In order to help our buildings adapt to the changes anticipated in coming decades, home performance contractors will need to take the following trends into account. Average temperatures are projected to increase, with most of the continental United States warming by 3–6ºF over historical norms by 2050. In general, the trend will be toward hotter summers and milder winters (though, as recent harsh winters in the Northeast have suggested, the trend may be far from uniform). US climate zones will shift northward, possibly by several hundred miles. Following are some of the implications for home performance. Heating season length and heating degree-days will decrease. Space heating as a fraction of total energy use will also decrease. Increased winter temperatures may expand the geographic range over which air source heat pumps are a suitable heating option. Increased use of A/C will drive up summer electric demand. Regions of the country where A/C is currently rare may see increased installation of both room air conditioners and central cooling systems (although properly sealed and insulated building envelopes may allow homes without A/C to remain comfortable across a broader range of conditions). The desire for A/C may favor forced-air and mini-split systems over hydronic systems. As formerly heating-dominated areas see increased A/C, cooling-driven moisture problems in building assemblies may become more common. Vapor barriers and retarders that made sense in the past may become a liability in a warmer world. Heat waves are among the deadliest weather phenomena, killing more people in the United States than floods, tornadoes, hurricanes, and lightning combined. While poor and elderly individuals are at particular risk, extended temperatures above 90ºF contribute to discomfort, psychological stress, and lost productivity across broad segments of the population. Climate change is projected to increase the frequency, duration, and intensity of heat waves. These longer, hotter heat waves will increase peak demand for electricity, placing stress on the grid and leading to rolling blackouts and other failures. Home performance measures, including envelope improvements, HVAC upgrades, and base-load electric reduction measures (which do double duty by reducing internal gains), are a proven strategy for reducing demand. Together with evolving smart-grid and energy storage technologies, efficiency improvements may make it possible to meet demand peaks without new generating capacity. Home performance upgrades can also make heat waves easier to tolerate, improving comfort by reducing unwanted heat and moisture gains through the building envelope while correcting problems with the distribution of cooled air. As heat waves increase, home performance contractors should become versed in passive cooling strategies, including “cool” or reflective roofs and exterior shading. Climate models predict increases in total precipitation in much of the northern United States and decreases in the South and Southwest. In all regions, most of this precipitation will fall in heavy rain- and snowstorms. This increase in extreme precipitation has necessitated redrawing 100-year flood maps, and extreme events pose challenges to homes outside flood zones as well. Heavy downpours may require installing or enlarging gutters, sump pumps, and exterior drainage. Heavy snowstorms may cause widespread ice dams, a problem that can be mitigated (though not completely eliminated) by attic insulation, air sealing, and ventilation. Preventing water intrusion—and designing mold- and moisture-resistant building assemblies—protects both the durability of the structure and the health of the occupants. 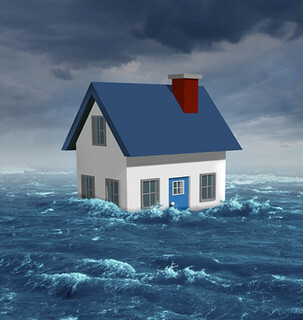 Elevating mechanical equipment from basement or crawl space floors protects it from future flooding. Severe storms also bring with them the chance of extended power outages. High-performing homes, with lower rates of heat loss or gain, show a higher degree of passive survivability—the ability to remain comfortable (or at least livable) until power can be restored. Severe droughts like the one currently affecting the western United States are projected to increase as the climate warms. Water and energy use are inextricably linked, a phenomenon known as the water-energy nexus. Hydraulic fracturing (also referred to as hydrofracking) for oil and methane requires large quantities of water. Thermal power plants also withdraw massive amounts of water for cooling, and hydroelectric dams require minimum river flows. Measures that save energy indirectly reduce demand for water, leaving more available for agriculture, wildlife, and recreation. And of course, measures that reduce residential water consumption—efficient fixtures and appliances—save not only water but also the energy needed to pump and treat it. Termite activity, now concentrated in the Southeast and in Southern California, may become more common in northern areas as the climate warms. Termite colonies are already present throughout the Northeast, upper Midwest, and Pacific Northwest, but these colonies have been held in check by winter temperatures. Home performance contractors working in these areas will need to learn about techniques to detect, prevent, and treat termite infestations. For example, an inspection gap at the top of crawl space wall insulation—required by code in some southern states—may become necessary further north as termites extend their range. Termites thrive in damp wood; home performance measures that manage humidity and prevent mold growth will also make buildings more resistant to termite damage. Other impacts of climate change may include more-intense hurricanes, stronger storm surges (which, in combination with rising sea levels, place more coastal homes at risk), and more frequent wildfires. Disaster proofing, which has not been a part of the traditional home performance agenda, offers an opportunity for knowledgeable contractors to deliver added value to their customers. The Insurance Institute for Business and Home Safety (IBHS, which represents an industry that has a strong interest in preventing catastrophic losses) has developed checklists and training materials for several types of disaster. For wildfires, guidelines include fire-resistant roof, siding, and deck details as well as landscaping and maintenance recommendations. For hurricanes, the focus is on structural strength and roof integrity. IBHS also offers the Fortified Home certification, which allows homeowners in some southeastern states to qualify for discounts on homeowner’s insurance. Wilson, Alex, and Andrea Ward. “Design for Adaptation: Living in a Climate-Changing World.” Environmental Building News Volume 18, no. 9 (2009). In a recent speech, President Obama quoted Washington Governor Jay Inslee as saying, “We’re the first generation to feel the impact of climate change, and the last generation that can do something about it.” Doing something about it means, most urgently, taking steps to curb emissions and keep carbon in the ground—the hard work that home performance contractors do every day. But we must also come to terms with the knowledge that, despite our best efforts, our children and grandchildren will live in a climate very different—and in many ways less hospitable—than the one we were born into. If we do so, and make a point of learning about the new challenges facing us, we can play an important role in helping our buildings—and the people who live in them—adapt to a changing world. Jon Harrod is the president of Snug Planet, in Ithaca, New York.